What's your name? How many other people do you know who share your name? 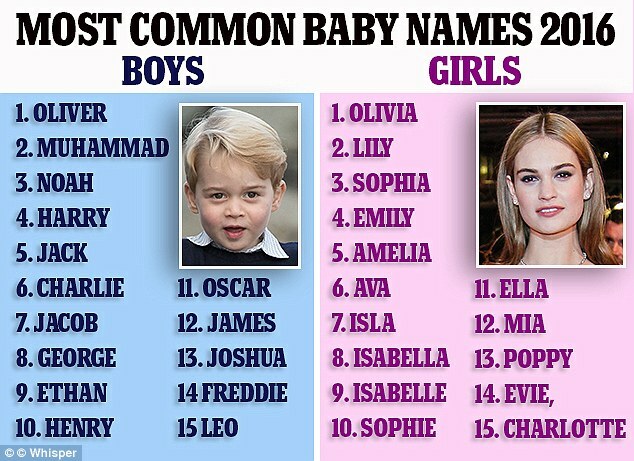 A recent survey by BabyCentre shows three dozen formerly 'popular' names which have yet to be registered in the UK this year. They believe that within a few years, these Monikers will be extinct. Seeing my name headed the list [Ok, it is alphabetical] I thought I'd look and see if I know anyone who has one of these names. I could find a link to all but 3 of them. I've tried to work out the decades when my friends were born. Are you on the list below? Bertram – I don’t recall ever meeting a Bertram. Do you recognise these famous people? So yes, most of these names do belong to people who are now aged 50 or older. 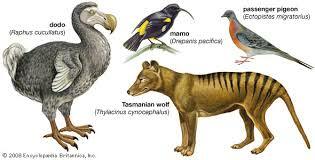 But I am not convinced BabyCentre is right about the extinction thing. Names come back into fashion again. Look at all those 'parlourmaid' names, Annie, Daisy, May, Mollie, etc and the 'Trad English' boys names like Stanley, Henry, Tristram, Julian, Arthur. I have encountered all of these in the classroom in the last few years - but can remember when people told me those would soon be gone and forgotten. Robin, Drew, Ali, Rowan, Alex, Jules, Andy, Brook, Harley, Jordan, Charlie, Jamie, Sydney and Stevie. I have taught all of these! 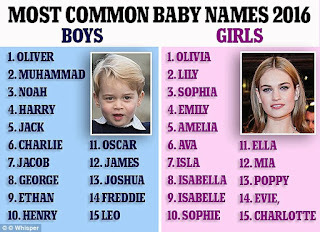 You can always name your offspring after the place they were born, it might start a trend. Mr and Mrs Nightingale were travelling in Italy - so child number 2 was called Florence. She made her name in nursing, the name became a lasting favourite, and even today you may know a Florence, Flo or Floss. Her sister was born in Naples, so received the old name for that fine city. 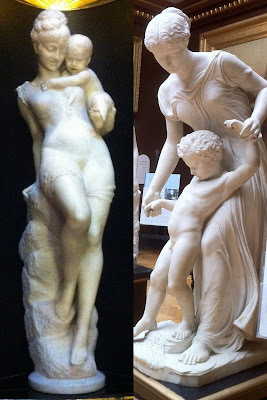 Somehow Parthenope has never caught on in the same way! I checked out the old names for our birth locations. 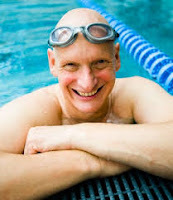 Bob and I would have been Addelam and Romfort. 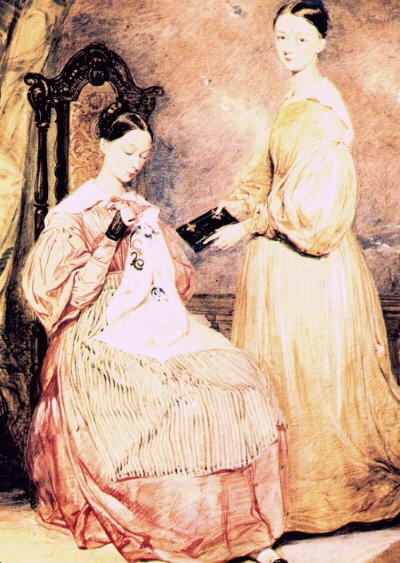 I am sure my girls were glad not to be saddled with Cetham and Becceham. One of my most embarrassing moments - I once met someone and asked her name. The reply - "I'm ---. 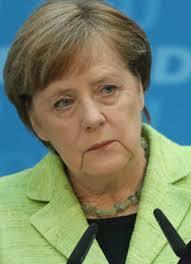 My real name is Angela but that is so ugly I changed it." Fortunately she never actually asked what my name was! Do you have an unusual name? Have you changed your name? UPDATE - today I taught Charlie, Alex and Gabriel! While Bob poked around in the plastic bins of planes and hammers and wrenches, I spotted a wooden box, upended on a heap of rubbish in the corner. 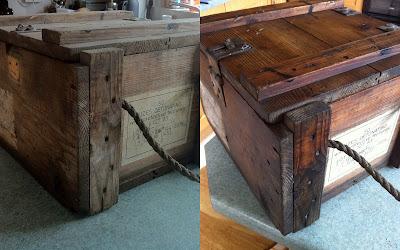 We came away with two woodworking tools - and a box to carry them in [in lieu of a 5p plastic carrier] The label on the box made it clear that it was of military origin - and once held fuzes. They would have been the detonators for mortars- making a very big bang! But the the box was incredibly dirty - I have no idea how long it had been kicking around the workshop, or why it came to be there. The wood looked dry and inside was dirt and dust. I took it into the garden and brushed it thoroughly with a stiff brush. A few nails needed hammering back in, and the lock plate was a little bent. Those faults were soon fixed. I wanted to make it look clean - but retain the labels. I made up some wood cleaning solution and went all over the box with it, using ultra fine wire wool. To protect the labels, I held a piece of scrap card over them so I could clean right to the edge. It didn't take long to make a really different to the dull grey appearance. You can see here the difference that just a few minutes of cleaning brings out the colour of the wood. Finally I gave it a light coat of beeswax and buffed it up to a shine. I haven't quite decided yet what to put into my box. It's strong and the rope handles make it easy to carry - maybe it will be good for carrying crockery and cutlery and condiments outside for BBQs. But whatever goes in it, I can guarantee it will not be weaponry - this is my equivalent of "beating swords into ploughshares and spears into pruning hooks"
It is believed that the name ‘rhubarb’ comes from the Greek, rha and barbarum —meaning “the plant of the barbarians”. 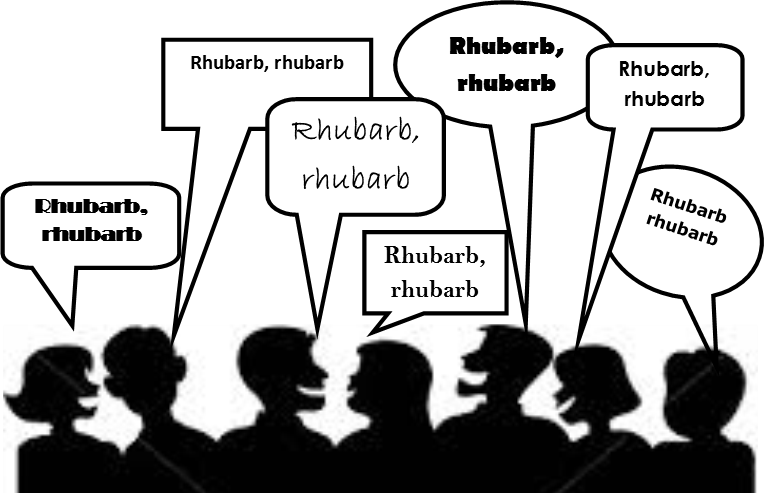 And ‘barbarians’ got their name from the words barbara and barbarous, meaning ‘to stammer’ and ‘strange and ignorant’. A very moist vanilla sponge with a fresh, tart rhubarb topping, spiced with vanilla and cardamom. The custard adds a lovely creamy texture, but can be left out if you prefer a firmer cake. Serve hot or cold, with or without cream. First, make the topping. In a saucepan, heat the butter, sugar and spice for the rhubarb mixture. 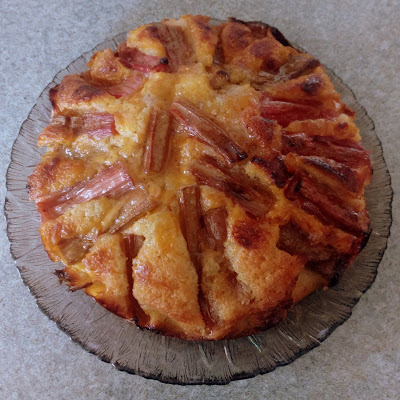 When bubbling slightly, add the rhubarb and stew for a few minutes until completely coated. Take off the heat and leave to cool. This stage can be done the day before you want to eat it. To make the cake, cream the butter and sugar until fluffy. Add the eggs one at a time, making sure each one is incorporated before adding the next. In a bowl, sift the flour, salt, vanilla sugar and baking powder and fold in with the wet mixture. Line a 23cm-diameter baking dish with high sides (minimum 5cm) with baking paper (or grease it well). Add the batter and spread evenly. If using custard, spoon it thinly over the batter. Carefully and evenly add the rhubarb mixture on top. Reserve a little bit of the syrup (a few tablespoons). Bake in the oven at 180C/350F/gas mark 4 – this can take anything from 35-45 minutes. Check with a skewer: if it comes out clean, it's done. Leave to cool, drizzle with the remaining syrup and scatter with the crushed sugar cubes. "His shoes were so thin, that if he stood on a thrup'ny bit, he could tell you if it was 'eads or tails" said my Grandad, describing some impoverished character or other. I loved thrup'ny [threepenny - 3d] pieces. I was so fascinated by these quaint dodecahedrons - other nations had round coins, but we had ones with twelve sides! These two are as old as me! The 12-sided 3d design was first planned in the mid 1930s. Just twelve were struck in 1936, with Edward VIIIs head on, as test pieces. But there were never any more minted, because of the abdication. Only 6 of this original dozen Edward VIII 3d coins have been accounted for - if you have one tucked away, it is worth in excess of £30K!! The coin only came into common use when his brother ascended the throne. 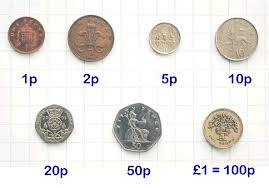 When decimalisation happened, in 1971, these little babies vanished, but we did get the heptagonal 50p piece, and then in 1982 the smaller 7-sided 20p coins appeared in our purses. And the Pound Note went, and we got round £1 coins with "Decus Et Tutamen" engraved round their edges. This Latin phrase means "an ornament and a safeguard" and refers to the earlier practice of 'coin clipping' where criminals nipped off the edges of the coins in order to glean the precious metals. Back in 1971, cynics were saying it meant "Ten-and-tuppence, cos that's all a pound is worth nowadays"
In 1998, along came the round £2 coin. This was a first, being made of two metals. 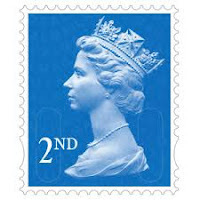 The Royal Mint continually strives to beat the counterfeiters. Anyway, here it is. You have until 15th October to spend the old round ones. The Royal Mint have produced an informative little video. If you really cannot wait to get your hands on a twelve sided coin, the RM have also issued a map showing the location of the banks which will be issuing them into circulation. I wonder how long they will take to roll into Dorset? Many of you will recognise that line of dots and dashes - it is RIP written in Morse Code. 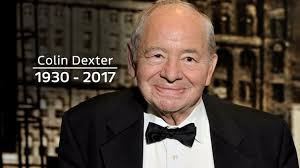 Last week, the great Colin Dexter, writer, cruciverbalist, Archers Addict and lover of fine ales, died at the age of 86. 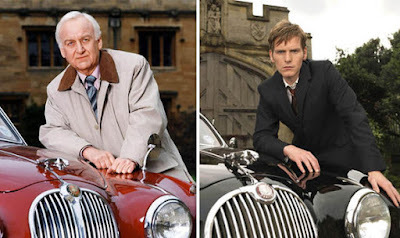 I started reading the Morse stories as a student in Oxford, and loved them - and then really enjoyed the subsequent TV adaptations. I was not alone in this - Dexter deftly combined the intellectual rigour of the Golden Age Detectives [like Wimsey]with the contemporary policework of shows like Taggart. It is just 30 years since John Thaw, and a fresh faced Kevin Whateley brought the books to our screens in January 1987. 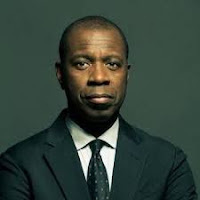 The TV adaptation, in their turn, have led to many hitherto overlooked literary police personnel becoming Sunday night viewing. On Saturday afternoon, the Radio 4 Drama was "A House Of Ghosts" - a drama written by Alma Cullen about one of Morse's earlier cases with Lewis. Cullen was involved in writing some of the screen plays for Morse episodes, and I listened with interest to the production. It is still available on iPlayer, and the stellar cast were superb. More here. I am sorry that ITV have not shown any evidence of marking either 30 years of Morse, or Dexter's death, and glad the BBC picked this one up. 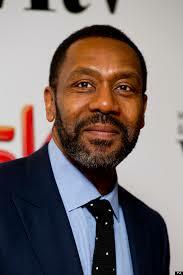 Having made a lot of money out of the sequel [Lewis] and the prequel [Endeavour] ... and maybe they have a Hathaway planned, who knows... you would have thought the commercial channel might at least have acknowledged the contribution of this truly gentle-man. 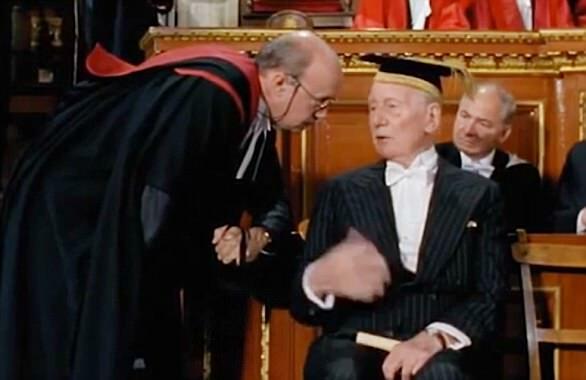 Here he is in a cameo role, sitting behind Sir John Gielgud! 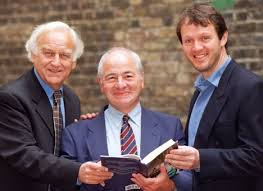 RIP Colin Dexter, and thank you. .-. .. .--. Yesterday morning I was sitting in bed enjoying the day's first cup of tea [thanks Bob] when I looked across to the black trousers hanging over the chair. It was created by the sunlight shining through the slit in the curtains. But that slit isn't a perfectly rounded shape. How does that happen? In the 4th Century BC, Aristotle asked how it was that light passing through quadrilateral holes, like woven fabric, produced circles not rectangles. So that all may look to JESUS, seeing him alone. This is the 'Museum of the Home' Very cleverly laid out, in a row of old 18thC Almshouses, you walk from one end to the other, seeing eleven different 'domestic' room scenes. Then you can visit the café and the shop, and sit outside in the beautiful gardens [also laid out in different historical settings]. The very comprehensive website is here. 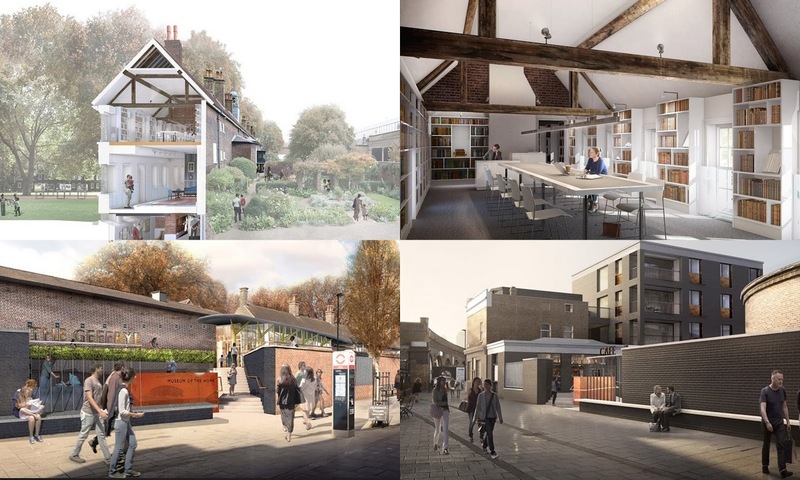 However, the Museum have been concerned for some time that they need to upgrade their facilities, in a carefully planned way - adding more study space, a better-laid out café etc. and open up the treasures to a wider audience. 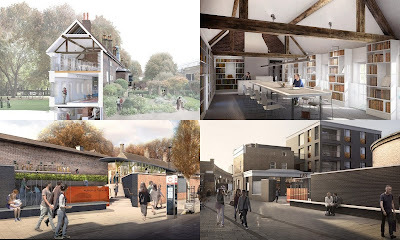 They've just announced that the "Unlocking The Geffrye" Project has obtained almost all the funding needed. The Museum will close at the start of 2018, for around 18 months, and re-open in Autumn 2019. This new development will benefit the local community and help retain the Museum as an asset for all visitors, for many years to come. I look forward to visiting again in 2020, ten years after my original trip, just to see how it looks! But maybe I will manage another peek before then, who knows? The Geffrye Museum is about domestic home life - unlike so many National Trust properties. NT houses often have the upstairs/downstairs feel about them - Lords and Ladies and their elegant rooms, contrasted with the basic bedrooms of manservants and maids. 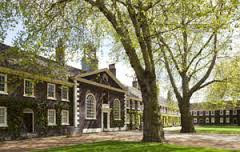 At the Geffrye, you get to see the 'ordinary' rooms, where people lived, worked, ate and slept. Years ago, with time to waste waiting for a train I wandered round WHSmiths at the station, and idly looked through their display of Easter cards. "Oh! These are no good, they're all religious" said the woman next to me. "But I'm celebrating the resurrection of Jesus!What do you celebrate at Easter then?" I said [Perhaps a little too brightly] Poor woman scuttled off towards the platform!! 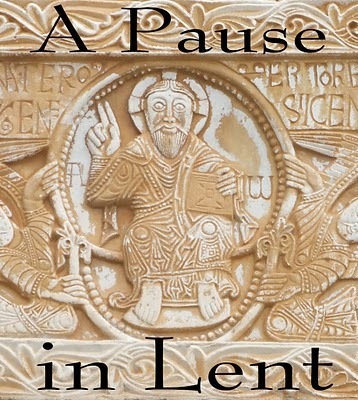 I thought of her this week, when I read in various places that "Easter is the new Christmas". 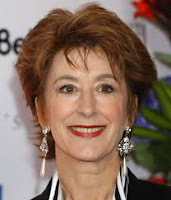 Carole Middleton, MIL to a future Defender of the Faith, advises chocolate eggs and mini meringues, and bunny hop races in your bunting-hung garden. 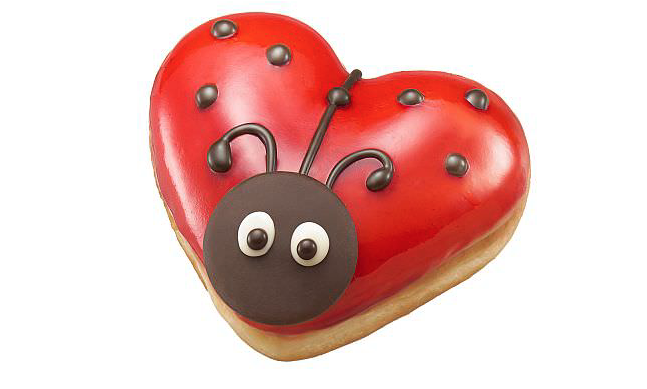 Krispy Kreme have a special range of Easter themed donuts, including the Lucky Strawberry Ladybug. 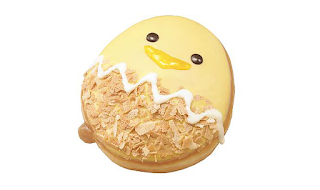 Meanwhile, another company has brought out a Cheester Egg, for those who dislike chocolate. 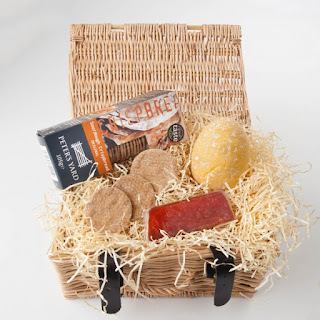 £14 for this egg - or more if you get the whole hamper. 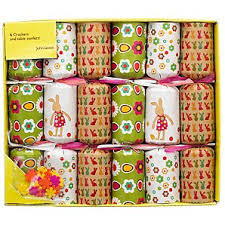 Waitrose report an increase in 'the demand for Easter Crackers' [people go into Waitrose and demand them?] It's a bit crazy if you ask me. 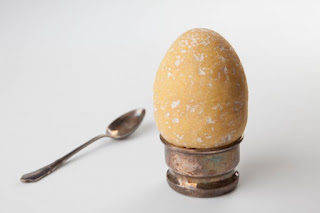 My children enjoyed a few Easter Eggs, and we had a Treasure Hunt round the house and garden involving dreadful doggerel clues with rhyming couplets. 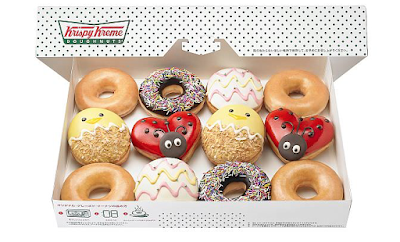 It's on top of the____________"
But the main reason for celebrating Easter was, and is, the joy of the resurrection and the New Life and hope which Jesus brings. I loathe the fact that the Christian season has been hijacked for commercial gain. 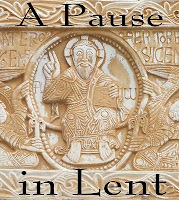 I am sorry that Good Friday is just another working day for so many people. But I suppose the upside is that I have an opportunity to share my faith with people. 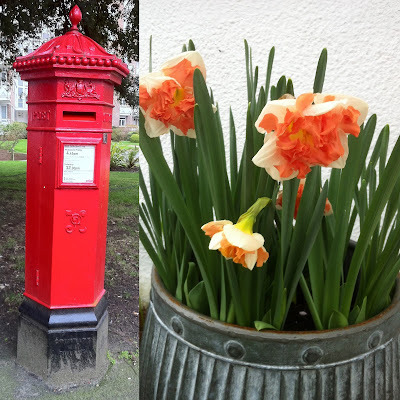 [BTW if you ARE planning to post any Easter cards, Christian-themed or otherwise] buy your stamps NOW as they go up in price at the Weekend! First Sign - Oh bother, I thought it was 20p. And I have one 20p coin, and no 10p coins,. Maybe someone downstairs will have change. Second Sign - That's irritating - they want 30p but admit that there is a fault with their loos. I continued down the stairs. - so there is no barrier needing 30p, ladies can move in and out quite freely. Third Sign Well, I hope the engineer takes her time in arriving, and I happily accept the apologies of the Station Manager! Our Tuesdays have been crazily busy lately - I am in London this week for WWDP - but last Tuesday Bob and I had a whole day off together. We packed it full of enjoyable activities. 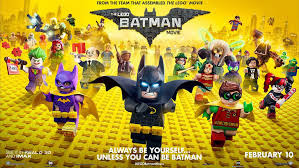 In the morning we went to The Pictures, following Steph's recommendation, to see The Lego Batman Movie. We got 'Senior' tickets, and took in a bag of cheap sweets and thermal mugs of coffee, in order to keep our costs down. We really enjoyed it. The film had loads of references to other films and earlier incarnations of the caped crusader. We both watched the B&W Adam West TV Batman in the 60s and chuckled at some of links there. Clearly aiming at audiences both sides of the pond, there were "English Robots" [aka Daleks] in evidence. After the cinema, we drove on into Bournemouth and parked up on the East Cliff near the Red Arrows Memorial. The area remains fenced off, following the huge cliff fall last April. We walked down to the Russell Cotes Museum, and ate our picnic lunch sitting in the garden near the grotto. We first visited RCM in September 2015, and have always intended to go again. Bob was keen to look at the current exhibition "Meeting Modernism" and I wanted to look at the drawings by Violet, Countess of Rutland. When we lived in Leicestershire, the "Kathleen Rutland Home for the Blind" was just up the road from where we lived. Violet was Kathleen's mother-in-law. She belonged to a group of aristocratic intellectuals who called themselves "The Souls" and drew portraits of many of them. We spent a couple of hours looking at these two special exhibitions and generally enjoying looking at many of the other paintings and sculptures on display in this lovely house. At one point I looked out of a bedroom window down to the beach below - it was a cool spring day and a little breezy.One or two people were walking on the sands. RCM has loads of pictures and sculptures of bathers - not surprising given its location. I thought these two, with mothers persuading their sons to have a paddle in the sea were great. One is holding her son as he gingerly steps in the water [he's naked and she's in a diaphanous robe] The other, on the left, has her son in her arms- he looks a little more anxious. We walked back to the car, and I saw a lovely bed of golden spring daffodils, planted up with purple hyacinths and gold and purple pansies at their feet. Such lovely colours together. The motto of Bournemouth Borough Council [I was confused by all the 'BBC' signs when we first moved] is Pulchritudo et Salubritas, which means 'beauty and health'. 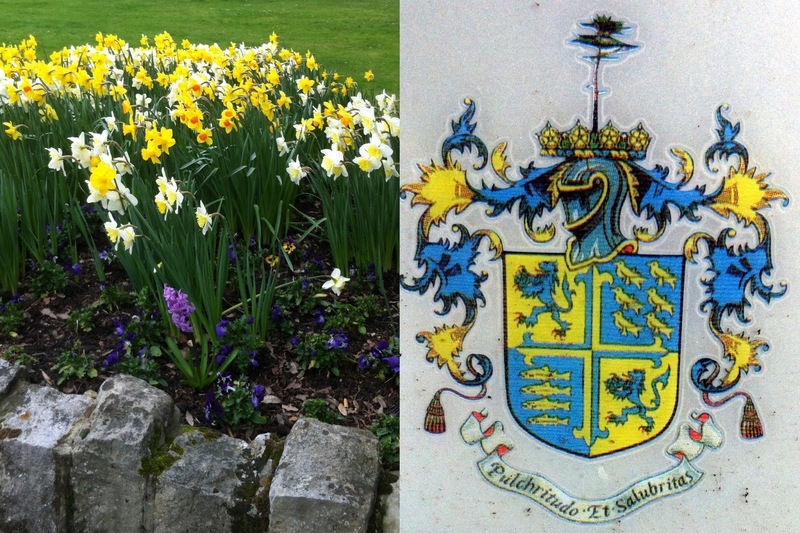 The crest was on the street sign just beside the daffodils. I had to take a picture of the Victorian Pillar Box - one of the 'Penfold' design. There aren't many genuine Penfolds still in use! Then after such a lovely day out, we returned home for a pleasant evening in with TV and a curry. There are more bulbs blossoming in our garden. These daffs are "Narcissus Sunny Girlfriend". Bob's sister and her husband gave them to us for Christmas- all planted up in the tub. There are 2 other sorts of bulbs in there as well - it will be exciting to see which ones bloom next. Fine Art is wonderful - but the design and colours of nature are even more stunning. One of Steph's early comments about her new company was that she loved the fact that the team drank plenty of tea during the working day. However, they did not have a teacosy. So she volunteered me to provide one [well, not many Mums can say their they have had teacosies exhibited in Norwich Cathedral] Things sort of spiralled out of hand - Tangible Branding is a consumer research company specialising in improving brand performance through discovering insight, making connections and generating ideas. 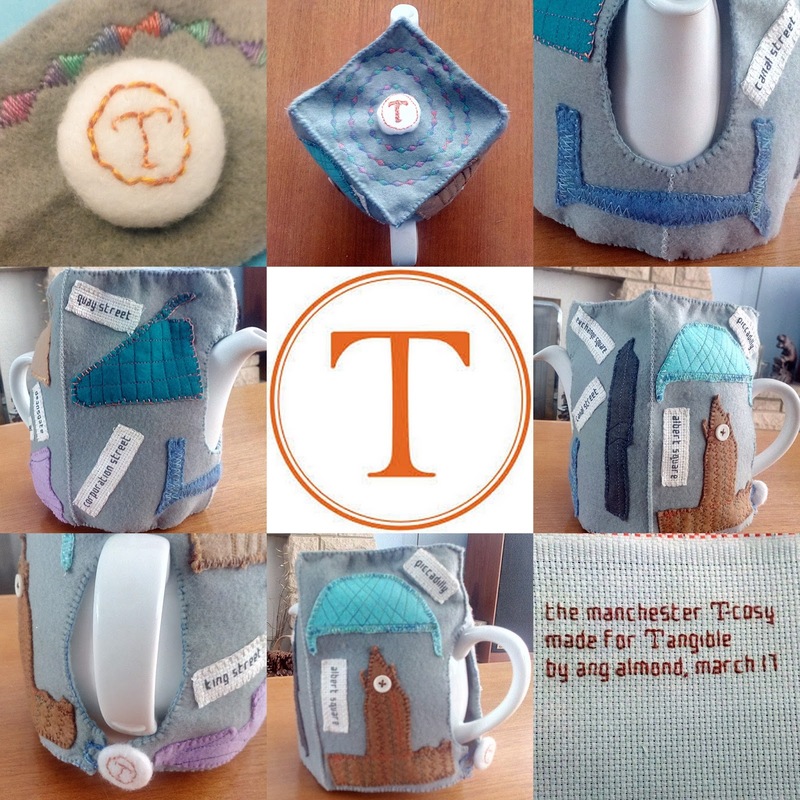 The brief—to make a tea cosy for the team at Tangible Branding. 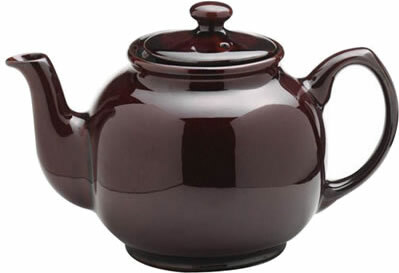 This was to fit the existing white china teapot, which is not the traditional round ‘brown betty’ shape. The cosy should have a ‘Manchester theme’. I decided to avoid football, music and TV links, and consider instead the architecture of the city. 2; my base colour is grey—to reflect the rain for which Manchester is famous, but more importantly, the steely determination of the industrialists and entrepreneurs who built this city. 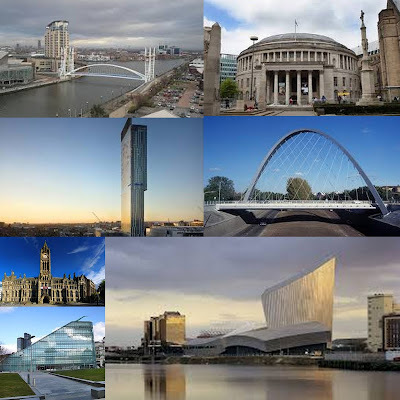 3; I chose 7 landmarks, recognisable by their silhouette—the Town Hall, the City Library, Beetham Tower, Urbis, IWM North, the Hulme Arch, and the Lowry Millennium Bridge. These were created in felt with machine stitched embellishments. These were then handstitched to the base. 4; Then I picked 8 streets—Deansgate [of course!] Corporation Street, Canal Street, Quay Street, Albert Square, King Street, Piccadilly and Exchange Square. These names were embroidered on evenweave linen and attached to the base. 5; The top was decorated with a spiral of machine stitching—which leads into [or maybe out from?] the centre– where there is a button with the Tangible logo.